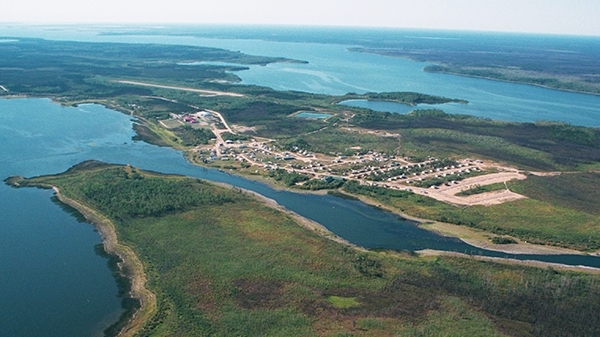 Based in Patuanak, the English River First Nation (ERFN) is a small close-knit community of both Dene and Cree people that has territory in 15 sites. In Patuanak, there’s one gravel road leading towards the La Plonge reserve and the town of Beauval. In summer, the other primary means of travel is by boat on the majestic waters of the Churchill River. Patuanak is home to approximately 700 people on reserve, with about another 700 living off reserve. The region provides a home and sustainable lifestyle to Cree and Dene people – the “people of the river” have come to the region for over a century to fish, hunt and gather, building an economy on the natural resources of the region. The community is highly influenced by its respected elders. They are widely consulted for decisions, wisdom, stories and strength. Elders are particularly important because the community is on the brink of losing its language. Education has always been important to ERFN with children going to residential schools in Ile a la Crosse and Beauval. The first elementary school was built in 1971, and in 2000 the high school was completed, eliminating the need for students to travel to Meadow Lake, La Ronge or Beauval for secondary schooling. In recent years, more has been done to bring back traditional activities, such moose-hide tanning, beadwork and Dene drumming. The community also hosts camp and youth conferences that promote the preservation of traditions and culture. While remaining true to traditional values as “keepers of the land,” members also pursue opportunities to participate in the development of ERFN’s rich resources. Many members are employed in forestry, mining and the array of support services necessary to the responsible development of their land and communities. In 2013 a Collaboration Agreement between the ERFN, Cameco and AREVA Resources formalized the long-standing relationship between northerners and industry. Their 2017 Report to ERFN Community Members outlines the year's progress and financial highlights.